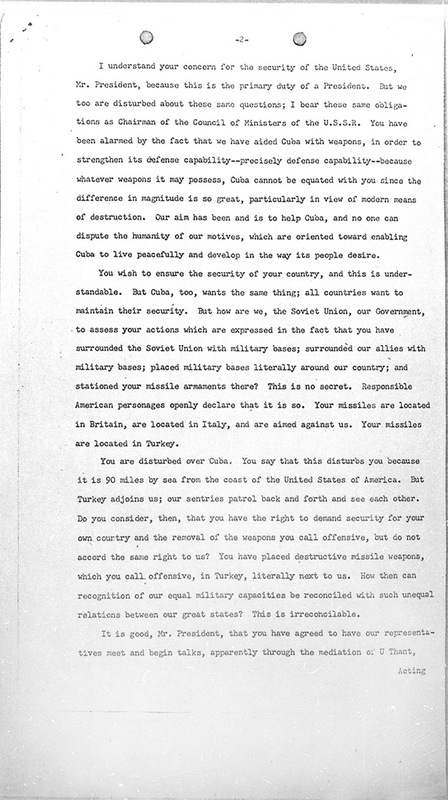 A second letter from Moscow demanding tougher terms, including the removal of obsolete Jupiter missiles from Turkey, is received in Washington. Over Cuba, An American U-2 plane is shot down by a Soviet-supplied surface-to-air missile and the pilot, Major Rudolph Anderson, is killed. 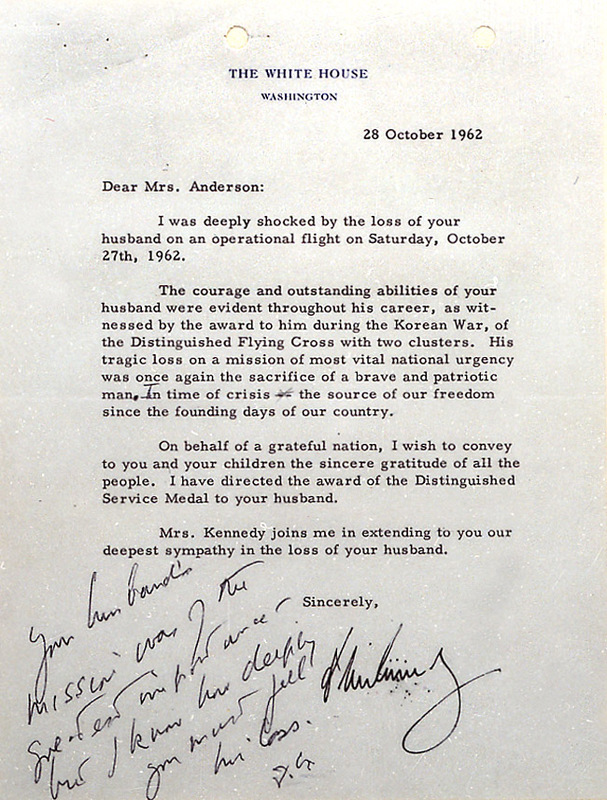 President Kennedy writes a letter to the widow of USAF Major Rudolf Anderson, Jr., offering condolences, and informing her that President Kennedy is awarding him the Distinguished Service Medal, posthumously. 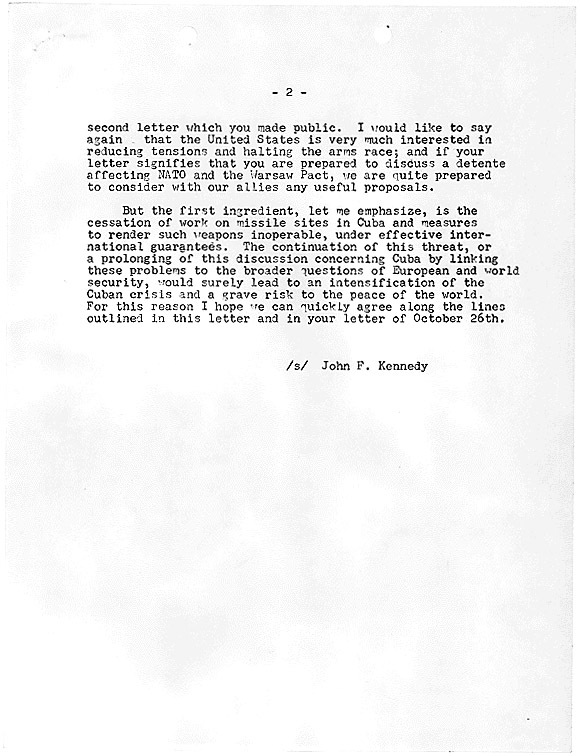 A working copy of President Kennedy's letter to Major Anderson's wife, on the event of him being shot down over Cuba. 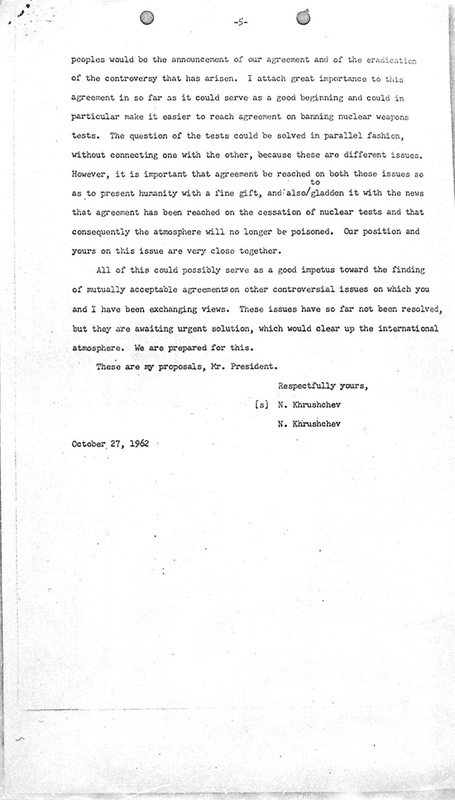 Premier Khrushchev's letter to President Kennedy, October 26, 1962. 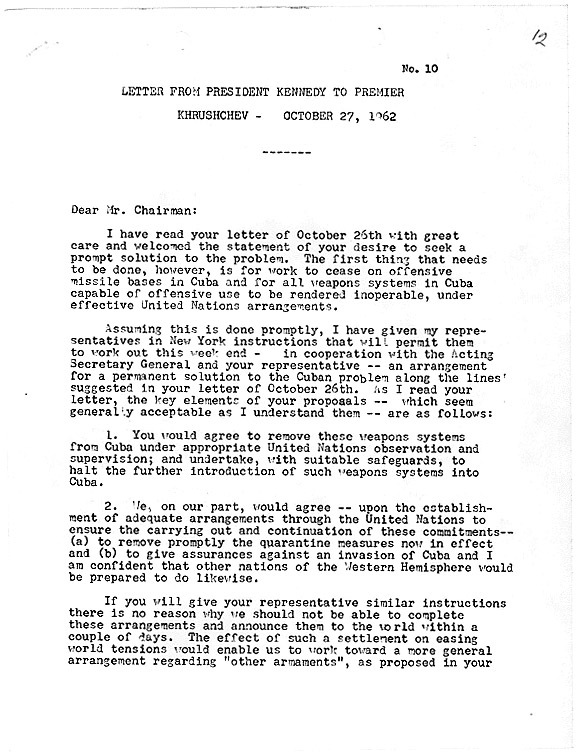 At a tense meeting of the Executive Committee, President Kennedy resists pressure for immediate military action against the SAM sites. At several points in the discussion, Kennedy insists that removal of the American missiles in Turkey will have to be part of an overall negotiated settlement. 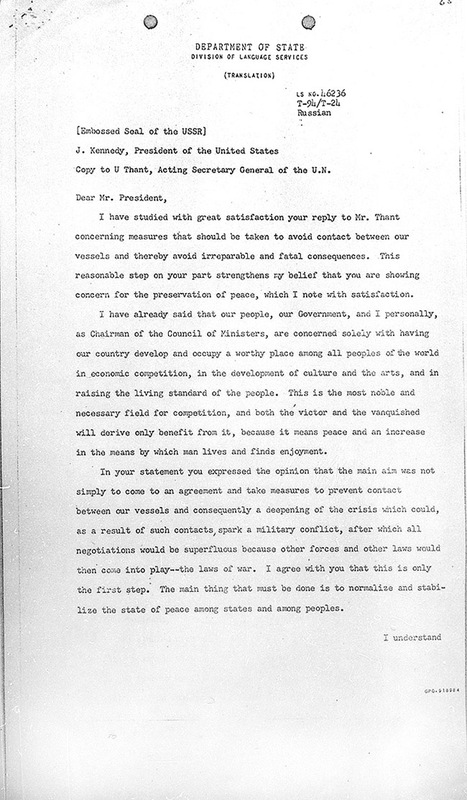 The Committee ultimately decides to ignore the Saturday letter from Moscow and respond favorably to the more conciliatory Friday message. Air Force troop carrier squadrons are ordered to active duty in case an invasion is required. Later that night, Robert Kennedy meets secretly with Ambassador Anatoly Dobrynin. 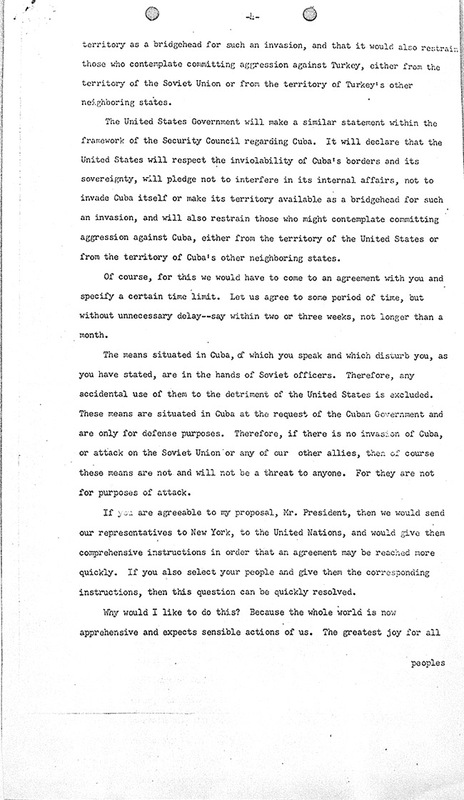 They reach a basic understanding: the Soviet Union will withdraw the missiles from Cuba under United Nations supervision in exchange for an American pledge not to invade Cuba. 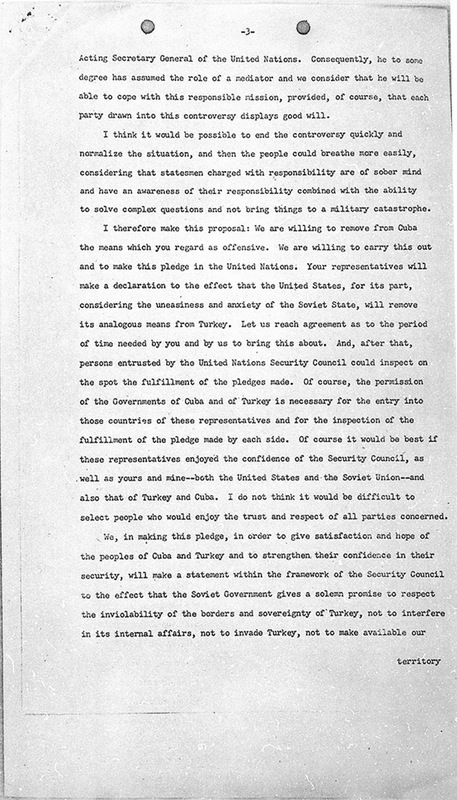 In an additional secret understanding, the United States agrees to eventually remove the Jupiter missiles from Turkey.